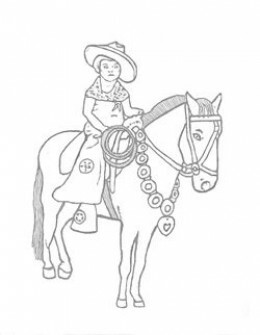 Find original and unique western coloring pages that are free to download and print. 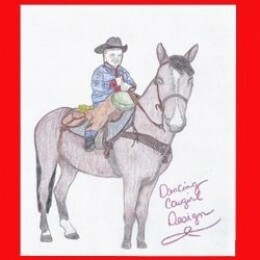 I have put together my latest creations of cowboys, cowgirls and horses on this page. 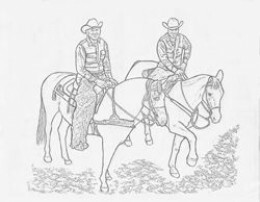 Like my Rodeo Coloring pages, they are all made from personal family photos. I make them using a combination of computer editing and hand drawing. My family has had many years of happy trails through our lives and this is one way that I chose to preserve and share those memories. These pages are all free for you to print and color but they can not be used for commercial purposes though. 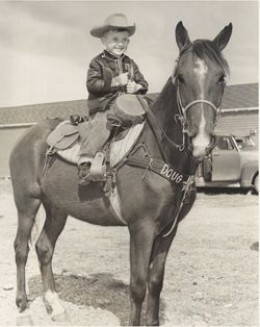 This is the photo I used to make the coloring page of my brother on his horse around 1960. He is set for a day of trailriding with his saddle bags packed and canteen filled with water. I colored this one and used it at the top of the page. This is a photo of my mom taken in the mid 1950's. I named it Sweetheart Of The Rodeo. Here you can see how I took the photo and removed the color, which was really black and white and left only the lines. I did some touch ups to clarify and darken the lines. It usually takes a two or three times of printing, scanning and re-editing until I am satisfied. Some pictures take several revisions. When I got this picture how I liked it, I colored it. 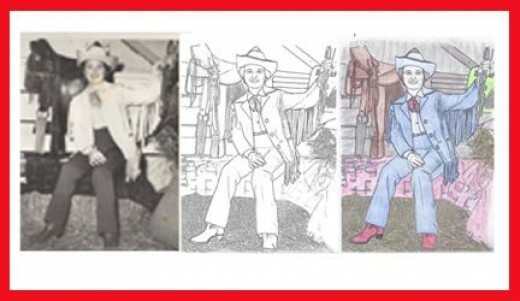 Do you remember getting dressed up for western day at school or to go to the rodeo when you were young? This is a picture of my husband from the 1950's dressed for we call Go Texan Day In Houston. 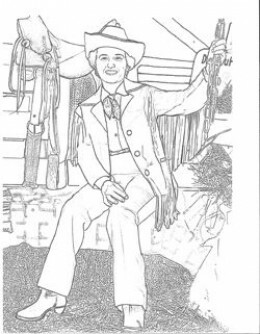 That is a day for everyone to wear their best western outfits to school or work in anticipation of the big Rodeo and Parade. His little tie even has Go-Texan on it. I think this will be great fun for little boys to color. 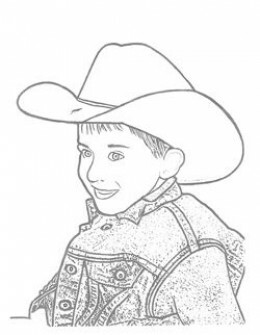 Keeping with the family tradition, here is my grandson wearing his cowboy hat and blue jean jacket. 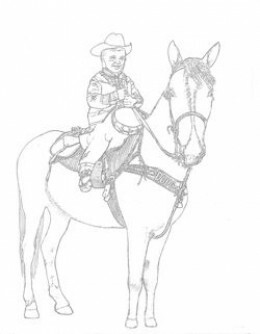 Of course I will say this is one handsome little cowboy. What color boots do you like? Well you can have any color you want when you create your own from this picture. 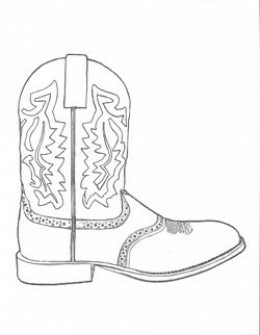 Cowboy boots come in many colors and have contrasting colors on the tops and bottoms many times. I have lots of boots in different colors that I have accumulated over the years. Thats a good thing about boots since they last a long time if you take care of them. Here she is again. This is my mom in the 1940's all dressed in western chaps, bandana and cowboy hat sitting on a pony for a picture. 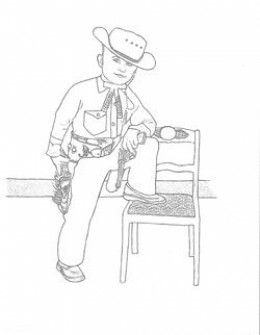 Here is a wild west coloring page for you. This was made from a picture of my grandfather driving this stage. Cooking over a campfire is always lots of fun but in the early days of trail riding, it was a necessity. 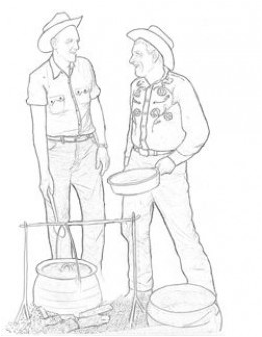 This is a coloring page that I made from a picture of my grandfather and uncle cooking cowboy style while they were on the trailride. My grandfather was in a western drill team. They performed at the opening of many rodeo performances. In this picture they were wearing their Angora chaps and satin shirts.